I decided to have McAdams Plumbing do the job, because the other company’s estimate was double what McAdams would charge. I had a toilet replaced and a new hot water tank put in. The pricing was very acceptable. I was very happy with the quality of work and the professionalism of the technician. 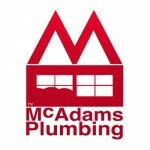 I will be using McAdams Plumbing for all my future plumbing needs. Thank you so much for the great review Saundra. We are so very happy to have you as a part of the McAdams Family. Your satisfaction is our #1 priority so please let us know if there’s ever anything we can do for you. All the best!